Plot. Income: 2. Initiative: 0. Claim: 0. Reserve: 5. Plot deck limit: 1. When Revealed: Kill each character. There Is My Claim #80. 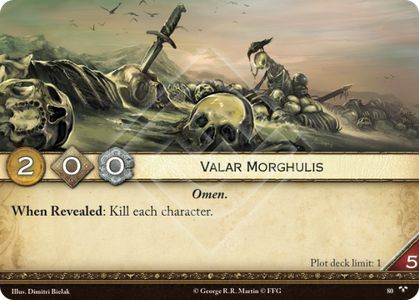 Valar, what can be said about the most prolific plot and possibly card from the CCG to the first edition of the game to now. It is and will always be the defining card of any meta. Every deck will either play it or have to be built to play against it. Even though card economy has changed since the games inception and reboot, Valar will be the ever loved or hated boogyman of the game.